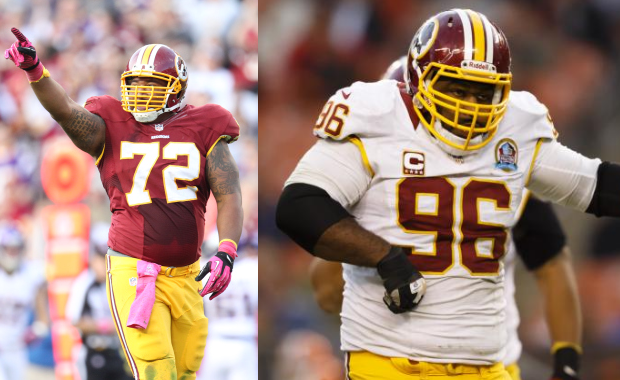 During the free-agency period in 2011 the Washington Redskins were focused on building the defensive line for their 3-4 front. The team signed defensive tackle Barry Cofield, a former NY Giant, and defensive end Stephen Bowen, a former Dallas Cowboy. Flash forward 4 seasons to today, and the Redskins released both players in a move that was done to save salary-cap dollars but ultimately needed to happen. Cofield never quite fit the 3-4 scheme as a nose tackle and Bowen, even when healthy, missed several games last season. The moves will save the team a total of $9.7 million. Cofield was scheduled to account for $7.678 million this coming season, and his release will save the team $4.2 million. Bowen was set to make $8.02 million, and Washington will save $5.5 million by letting him go. The moves set the team up with $23 million in cap space heading towards free-agency in a few weeks. The releasing of Cofield and Bowen and the signing of defensive end Ricky Jean-Francois are positive signs that the Redskins are serious about rebuilding their defensive front. Cofield and Bowen were both over 30, over-payed and declining with nagging injuries. Cofield only played in 8 games in 2015, Bowen appeared in 9, so both players being let go doesn’t come as much of a surprise. Cofield was released with the “Failed physical” designation according to the NFL’s transaction report, Bowen had no designation. In other news, the Redskins also re-signed right tackle Tom Compton to a one-year deal worth $660,000.